Sunny skies and bright faces were seen Monday morning at the Strathmore Stampede grounds as hundreds came to support the children of Pacekids Programs at the 2nd annual Wagons for Wee Ones, presented for the members of the World Professional Chuckwagon Association (WPCA). 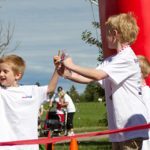 Pacekids works towards improving the physical and mental capabilities of children with special needs within the Calgary area. Not only do these programs benefit the children, they help their family members better their understanding and skills while helping their little ones reach those important milestones. Through fundraising contributions such as the 2nd annual Wagons for Wee Ones, Pacekids is able to continue these important efforts. For more information on Pacekids, visit www.pacekids.ca, or follow us on Twitter (www.twitter.com/Pacekids) and Facebook (www.facebook.com/PacekidsPrograms). Pacekids Programs is family-focused and strives to offer excellence in the treatment of children with special needs emphasizing a trans-disciplinary, direct-treatment approach. In 2011 Pacekids celebrated its 17th Anniversary and provided services to over 120 children and their families through a private ECS program – licensed by Alberta Education, a unique Family Support program for infants, and one-on-one aide support. To learn more about Pacekids Programs visit www.pacekids.ca or contact the Pacekids office at 403.234.7876.